Click to read Part I, Part II, and Part III of the Rose Bowl series. And now, for the last part in our series, we move onto the crucial play, the Verner interception return. Here Cal has Hawkins and Jackson lined up to the top, and two running backs, fullback lined up on the weak side (perhaps trying to draw the defense into the perception that it could be a run, even though 3rd and 6 and trailing is hardly a rushing down). Like I said earlier, the easiest way to attack the Cover 4 is to attack outside the hashmarks around 5-10 yards. That is in fact what Tedford seems to do here. A successful catch would have picked up a first down, and perhaps the necessary yardage for the first down. Jackson moving in motion behind Hawkins is probably to ensure that either Hawkins will be the primary on the deep route or Jackson will be catching short. 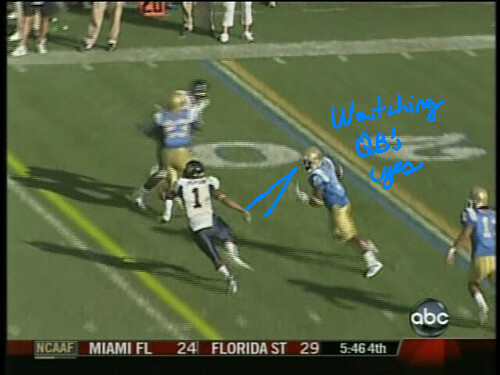 UCLA isn’t playing the Cover 4 on this play. In fact, they’re not even playing deep coverage. This is definite Cover 2, a scheme where short passes to the outside go to die. 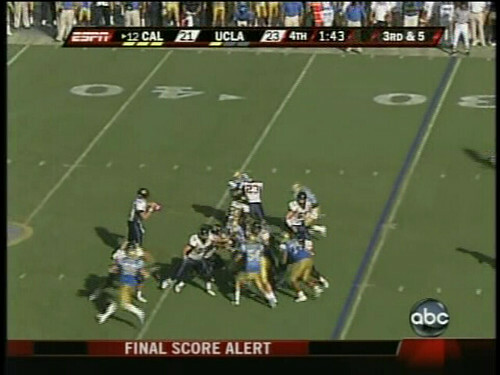 See the spacing that UCLA is giving Cal on the line of scrimmage as opposed to before? They’re conceding the deep ball because they’re not expecting one. In a Cover 2, you want to attack the middle or straight up vertically. The safeties are playing deep, but the middle is there for the taking, so a tight end down the middle (like the Stevens TD call earlier) could go for maximal yardage–at the end of the game, with a quarterback not known for adjusting, you go with what works. So an out pattern is a risky move because the corners are playing you up close and if they’re able to read the quarterback’s eyes. As the play unfolds, you have the fullback Ta’ufo’ou blocking, you have Forsett staying in for blocking, you have Stevens saying in for blocking, and the safeties are playing away from the ball. In other words, you have massive protection on Longshore (8 blocking 7)…while Hawkins and Jackson are now strewn into the teeth of the secondary. Whether Tedford intended the play to unfold this way or not, the defense has a huge advantage here because Longshore is now going to have to pass into coverage. And again, his eyes won’t leave his receiver (this time Jackson). Worst of all, it’s our old buddy Alterraun Verner who’s reading it all the way. At first he seems to be playing Jackson off the ball. The expectation is that Longshore might try a similar throw that he did to Hawkins on the last play, run an in-route. So Tedford tries to go the other way, thinking this time they’ll fool the corner. As Jackson begins to cut, for the second straight interception, Verner is reading Longshore’s eyes. Reading, reading, seeing him lock in; he doesn’t have to react to where Jackson is running. He can just watch where the quarterback’s eyes are going and follow the motion. Verner sees the throw coming, steps in front, and ballgame. There’s not much Longshore couldn’t have done here with regards to the throw. 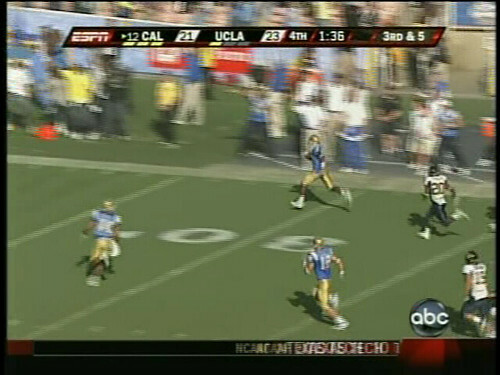 That throw was right on the money and would’ve been a first down if Verner hadn’t been so high up on watching the ball. It’s his ability to survey the field and look for all possible options that really plagues him. There are definite weaknesses within his mechanics, i.e. he does have a tendency to lock onto his receivers, as commenters have noted. 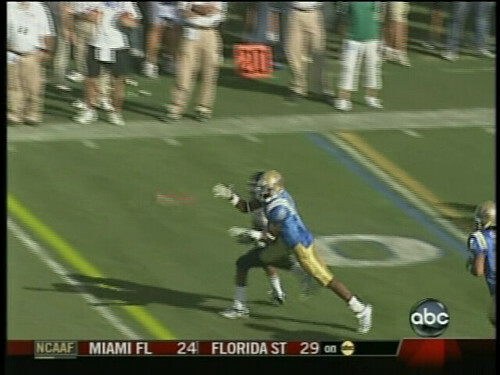 But credit UCLA’s defense for recognizing this weakness in time to save the game. 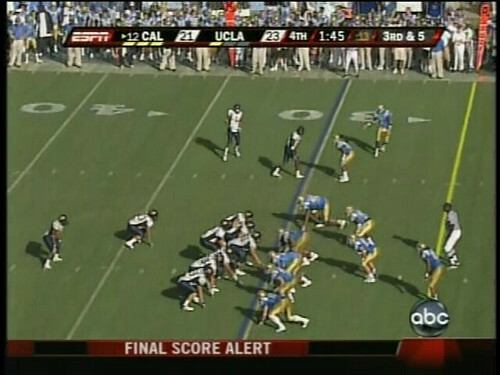 Now if this had been ihe traditional UCLA defense, it’s a first down and Kay has a much shorter field goal that even he could probably deal with. But Walker upped Tedford here by (1) knowing that it would be a pass, (2) knowing that it would be a pass to the side of the field to exploit the Cover 4, (3) knowing Longshore couldn’t have beat them with a deep throw, that the throw would be a maximum 10-15 yards. 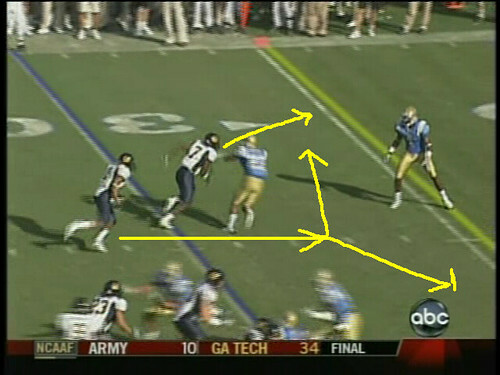 This adjustment was all UCLA needed to win. In other words, good defense prevailed over good offense, just like it usually does in football. Any thoughts on this series? What else did you notice from this four part dissection of Cal-UCLA?